In the most moderately whelming transaction of the trade deadline, Michael Grabner was shipped across the Hudson to join the New Jersey Devils as a result of the first ever trade with the rivaled New York Rangers. As Grabner heads southbound on the New Jersey Turnpike, 20 year old KHL Defense Prospect Yegor Rykov and a second round pick in the upcoming 2018 NHL Entry Draft head northbound to balance the ledger. As with any trade of any magnitude, there are many angles in which to analyze. The Devils added a middle six forward known for elite speed, dependable penalty killing, and streaky scoring without giving up anything from their active roster. Grabner is a 30 year old rental winger with a $1.65 million contract set to expire at the end of this season. Going the other way is a second round pick in this year's draft, known for its deep class of prospects and 20 year-old Russian Defenseman, Yegor Rykov, who landed just outside Corey Pronman’s Midseason Top 50 Prospects List as an honorable mention (Posted on The Athletic). There is legitimate concern that Rykov may never leave his roost with SKA Saint Petersburg to play in the NHL, but his value as a smooth-skating, LHD with a strong first pass is quite high. Anyway, I'll save the rest of Rykov's story for later, where Ian Pulz (@HockeyPulz) shares his insights from his time scouting Rykov. Grabner led the New York Rangers in goals with 25 and has resurrected his career since posting consecutive sub-20 point seasons with the Islanders (2014-15) and Maple Leafs (2015-16). In his last season and a half with the Rangers, Grabner scored 71 points, with 52 goals in 135 games. Jesper Bratt has seen his production grind to a modest pace. Miles Wood is a high-end bottom six winger. Brian Gibbons is on the shelf with a thumb injury. John Quenneville is inactive with a knee injury. Blake Coleman excels in his role as a bottom six spark plug. Jimmy Hayes and Drew Stafford hover around replacement level. If this team is going to compete for a playoff spot and make any noise at the dance, they needed better players flanking their centerman. Enter Michael Grabner, who joins a crowded middle 6 and likely pushes Jimmy Hayes to an extended stint in the press box. The roster tool below shows the change to the lineup expressed in Gamescore per hour. Gamescore is a metric developed by Dom Luszczyszyn of The Athletic which weighs stats found in a standard box score to evaluate performance of a player during a game. More on Dom’s metric here. If there are reasons to dislike this trade, they come in the next three sections. Grabner is on a deal that expires in a few months. It is not guaranteed that he will sign with NJ during that span so there is a large degree of risk involved in the potential long term benefit of the move, hence the term “rental”. Giving up two pieces of good value for a few months of Michael Grabner's services would not be ideal. Grabner's age places him outside the two dichotomous core groups the Devils have. 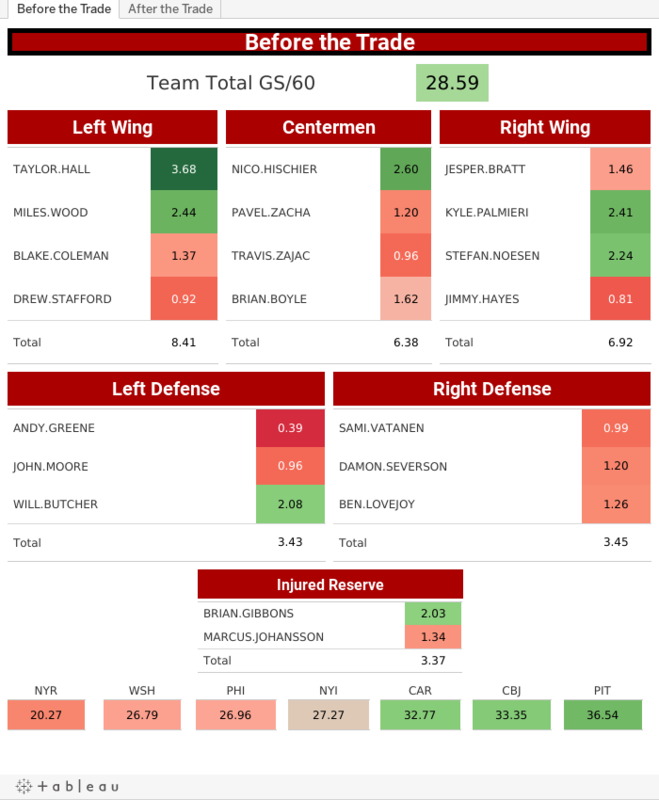 The team features young guns like Hischier, Bratt, Butcher, Severson, and Zacha representing the young core and a group of players like Hall, Palmieri, Moore, Vatanen, and Johannson who represent the older core. That said, Grabner is around the same age as Cory Schneider, who is 31 and is undoubtedly part of the team's mid-term plans. If the Devils expect solid play from injury-prone Schneider well into his mid-thirties, I suppose the same can be expected of Grabner who has experienced only 2 IR-worthy injuries in his career. In terms of on-ice play, I’m not sure there was a winger on the trade market that fits the Devils’ playing style better than Grabner. His speed fits right into John Hynes's system and causes match up issues for opposing coaches planning against the speedy Miles Wood. Play Wood and Grabner on different lines and opposing coaches have to strategize​ against elite speed on more than one line. Pair the duo together and teams now have a whole different challenge of defending two top 10 speedsters at the same time. "Yegor Rykov plays a defensively-sound, puck-moving defenseman’s game. Rykov is finishing his second full season with the KHL powerhouse, SKA St. Petersburg, where he has been logging an average 12:24 minutes of ice-time per game. Rykov’s game has been steadily improving since his draft-eligible year (2015) including improvements to positioning and more refined stickwork. He also finds himself in prominent special teams’ situations, including important PK time for SKA St. Petersburg. While he is not high enough on the depth chart for his KHL team to log powerplay time, during his time with the Russian World Junior Championship team and his stint with the VHL affiliate of SKA, SKA-Neva St. Petersburg, Rykov found himself manning the top powerplay-unit in addition to the top PK unit. Rykov’s top asset is the way he thinks and sees the game on the ice. He’s also excellent at breaking up plays and causing turnovers. His ability to skate the puck up from the defensive zone and either clear the zone himself, or rifle a pass up the ice to an attacking forward helps him find the scoresheet in the form of assists, and his all-around collection of skill, size, skating, and smarts, make him a prime candidate to make an impact on NHL ice. Some needed improvements to his game include becoming faster with his on-ice decisions, playmaking in general, and to continue to improve his defensive positioning, specifically against larger forwards. He’s a big guy, and he’s got the frame to win board battles, but he just needs to improve on that. The big question regarding Rykov is what his intentions are regarding coming over to North America to play in the NHL. His contract with SKA expires at the end of the 2019 KHL season. This contract was a 3-year contract extension Rykov signed back in October, 2016. If everything works out with Rykov’s development, he has the potential to be a 2nd pairing, all-situations, puck-moving defenseman at the NHL level. His play style comparison (strictly style, not skills comparison) would be Sami Vatanen." As made clear by Ian's description, Rykov is a valuable prospect who carries the risk of never playing hockey in the NHL. However, if he does decide to bring his talents to North America, he will likely provide utility as an everyday NHL defenseman. This move produces four prominent storylines. Ray Shero may as well have gone so far as painted the 2018 Stanley Cup Playoffs logo onto the ice in Newark with this move. It is clear what his expectations are for the remainder of the season. Much like Ron Hextall did by acquiring Petr Mrazek for the Flyers, Ray Shero is rewarding his players for their season-long execution. The players have done their job and are somewhat unexpectedly poised to end the 5 year playoff drought. Adding Grabner is the break that this team may feel they deserve. This move shows Taylor Hall that this team is ready to compete now. Taylor Hall’s 7 year, $42M contract expires after the 2019-20 season. The Devils have to convince him that they are a perennial contender before that deadline to have any chance of resigning him. I don't personally love the price paid, but I am very excited to see how this team performs as the playoffs draw near. Ultimately, my opinion will be formed on two contingencies: Whether or not Rykov ever plays a game in the NHL and if Grabner re-signs/is productive in New Jersey. I don't think this makes the Devils a serious contender to get out of the East, but I think the playoffs are now more likely than not, and New Jersey may even win a series depending on mathups and seeding. I'd love to hear what you think! Like, share, and comment below. Thanks for the read!